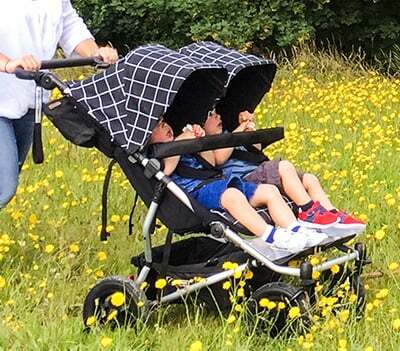 As I become a mother of twins, I couldn’t resist to try Mountain Buggy Duet. 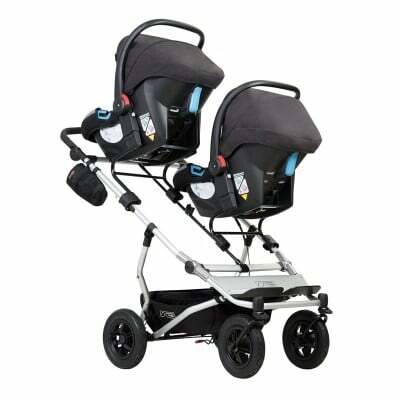 This is a great side-by-side double stroller for everyday use. It’s perfect vehicle for families living in a city, but it also handles off-road cruising. 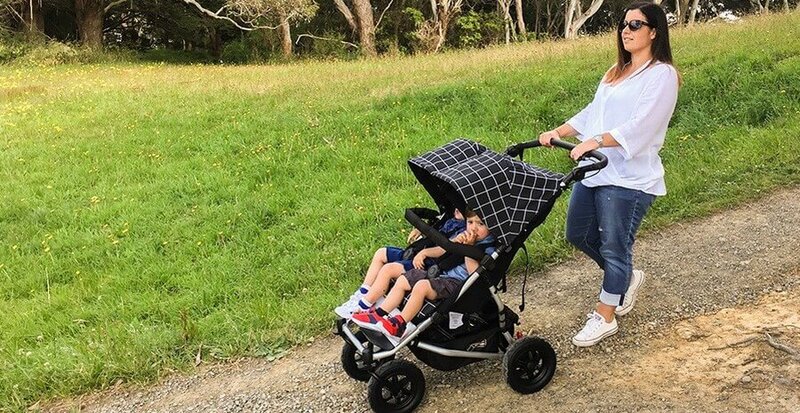 When you decide to buy a double stroller you don’t want it to slow you down when you’re out and about with your babies. You want it to be easy to use, durable, safe and comfortable for your kids and suitable to go wherever you want. And Mountain Buggy Duet 2017 is exactly that stroller! It is an investment for years. Parents can use it from day one till toddlerhood, with two infant car seats, two bassinets, two regular seats or one of each. It’s design for twins and kids close in age. Parents often worry that double strollers are bulky and difficult to steer. But not Duet! It is slim and nimble like a single stroller and can handle any type of terrain. I tested it on NYC streets and parks and dirt roads when we visited my family in North Carolina and it never let me down. 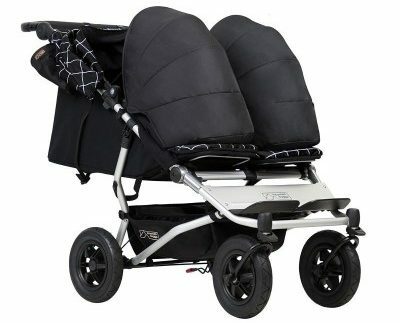 Below you can read my Mountain Buggy Duet review and find out if this stroller meets your needs. I would like to start my Mountain Buggy Duet 2017 review by discussing the most important features of this stroller. I reviewed the newest model of this stroller – Mountain Buggy Duet V3 (2017). At the end you can also find comparison with 2016 model. As for a double side-by-side stroller Mountain Buggy Duet is really slim and narrow. It’s just 25.6” wide, so its wheel base isn’t wider than many single strollers. Parents of twins don’t have to worry about fitting through doorways or elevators anymore. Thanks to such a compact size this stroller is perfect for getting around the city and shopping malls with two kids. It fits seamlessly in narrow store alleys and tight corners. This stroller is equipped with one hand folding and stands on its own when folded which simplifies storage. 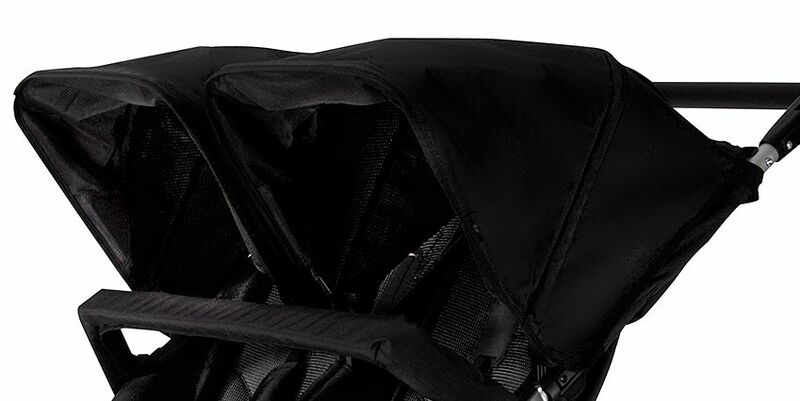 Folded stroller lies or stands on the wheels, therefore fabrics don’t touch the floor or the ground. When we fold the stroller properly we’ll hear “click” and we can be sure that the frame is locked automatically. Folding is pretty simple, but it take some practice. Once you’ve got it it’s very easy and convenient. It takes only three steps and it’s quickly and doesn’t require bending all the way down. 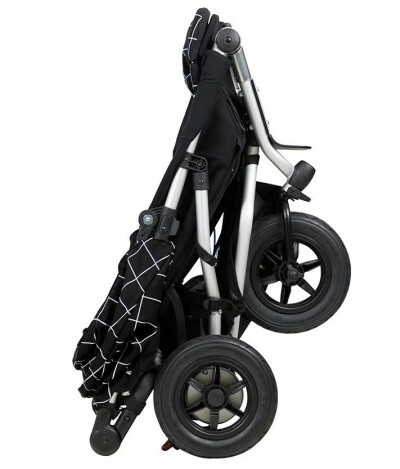 After folding dimensions of this stroller are: 35″ (H) x 25.6″ (W) x 12.5″(D). As for a double stroller, the fold is pretty compact and doesn’t take up much space. It’s worth to mention that the new model – Duet V3 from 2017 has smaller fold than the previous version. Unfolding takes two steps and requires two hands, but it is also very easy process. Mountain Buggy Duet has four 10” wheels with air-filled tires which perfectly absorb shocks and bumps. You can go through all kind of terrain and this buggy will provide you and your passengers with comfy ride! The wheels glide smoothly not only over flat surfaces, but also handle rougher terrain! I’ve pushed it over unpaved roads, gravel, grass and sand. 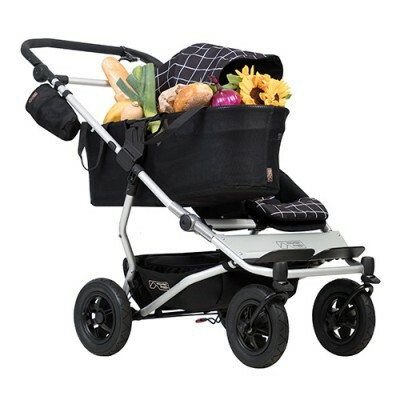 For more bumpy terrain parents can lock the front wheel to increase stroller’s stability. On the other hand, swivel front wheels give better agility on tight turns. Remember to pump the tires every few weeks or months, depending on how often you use the stroller and the terrain you stroll over. You can use regular bike pump to do that. I was surprised when I took my sons for the first ride in this stroller. It’s so easy to push and turn, that I forgot it is a side-by-side double stroller! It’s very compact and pretty light (as for double buggy). It handles city streets and old cracked sidewalks very well. Riding over curbs is also easy because we don’t have to use so much force to lift the front wheels, as in many other double strollers. I’ve read many Mountain Buggy Duet reviews written by other parents and they praise its multi-functionality. This stroller is wonderful not only for city use, but we can count on it during off-road trips too! In other Mountain Buggy Duet reviews parents mention also ease of use as a big advantage of this stroller. I totally agree with them. Maneuvering is very convenient, we can push this stroller literally with one hand. Although this is a double stroller, it’s agile like a single one. Psst! I bought Mountain Buggy Duet 20% cheaper and saved quite a lot of money. You can check out currently available discounts >> here <<. Mountain Buggy Duet 2017 offers a variety of seating options. We can use this stroller since day one (thanks to additional attachments) till toddlerhood with its regular seats. Mountain Buggy Duet is compatible with many car seats and can be turned into a travel system for one or two babies. 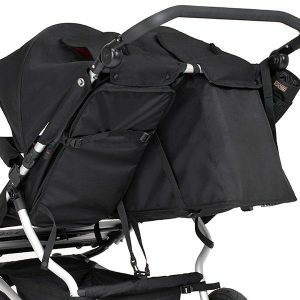 To use this stroller as an infrant car seat frame we just have to purchase proper adapter (for one or two car seats). 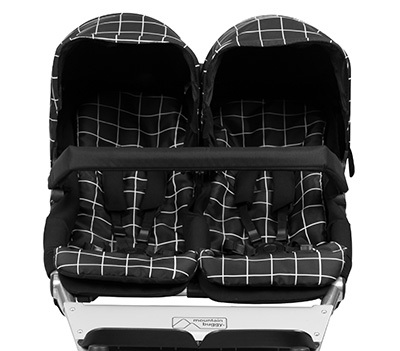 Duet is compatible for example with Maxi Cosi Mico, Graco Classic Connect, Chicco Keyfit and Peg Perego Primo Viaggio. In the picture above you can see Mountain Buggy Duet with two car seats attached. Not every double stroller allows to click two infant car seat, so it is a big advantage of Mountain Duet V3 that he has this feature. In my opinion bassinets are the best option for strolling with newborns because they provide the best support for their delicate backs. However, it is little more difficult to transfer baby from the car and house, than when we use this stroller as a car seat frame. I was using this stroller with car seat when I had to run some quick errands, but for longer walks I always used carrycots. I am a big fan of bassinets and prams and I’m very glad that Mountain Buggy Duet is compatible also with a carrycot. 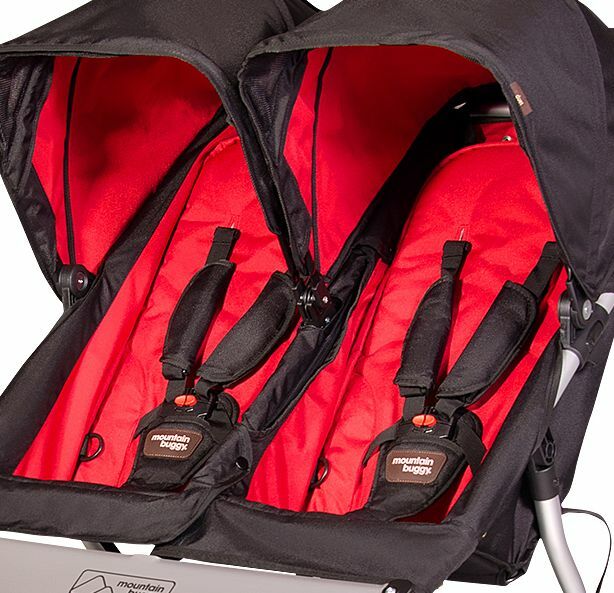 If you’re planning long strolls with your newborns, carrycots are a must have. There is one more option for newborn. According to the manufacturer the seats are suitable for newborns thanks to fully-flat recline. However, in fully recline position the seat is still few degrees reclined, so I wouldn’t use it for newborns without any additional attachments for better support. But there is one solution. Parents can add a Newborn Cocoon which provides proper support for infants delicate back, neck and head. As you can see in the picture, cocoon attaches to the fully reclined seat. Cocoon is also sold separately, but it is cheaper than carrycot. Check it out here. Mountain Buggy Duet can be also use with two different seats which is a great option for parents who have children of a similar age. For example we can install one car seat plus a regular seat, or a carrycot with regular seat. Even when you use Duet for two kids close in age, you can be sure about your children’s safety. This side-by-side stroller is very stable. It doesn’t pull to the side and rolls in a straight line, even if one passenger is heavier than the other one. I pushed this stroller with 8-month-old and and 3-year-old (average size) and they love riding in this stroller. It has really great weight distribution. If your kids are about that size and age difference this stroller is an excellent option for you! This stroller has two regular seats placed next to each other. The seats recline independently from a fully reclined position suitable for younger babies, to upright position perfect for older kids. The seats adjust separately, which is very useful feature, because many times when one baby wants to nap, the other one wants to sit straight and watch surroundings. This features is also very handy for parents of two children of a small age difference. They can go for a walk with their younger baby napping in a fully reclined seat and the older one sitting upright. To recline the seat we just need to use the straps on the back. The seat back height is approximately 25.1 inches and can accommodate a passenger up to 39.6lb, which means this stroller will serve you for around 3 or 4 years, depending on your baby’s height and weight. Some parents may worry whether their toddler will fit in this narrow seat. There is no need to worry about it! The seat is wide enough for my 3 year old daughter, even with a winter coat! I can easily fit my hands on each side. There are also colored seat liners which are reversible so we can use them depending on our color preferences. During strolling something always spills out and thanks to this washable liners we can clean everything easily and fast. This stroller has also a bumper bar (one for both seats) that opens like a gate. Thanks to it we can easily take our children in and out of the stroller. 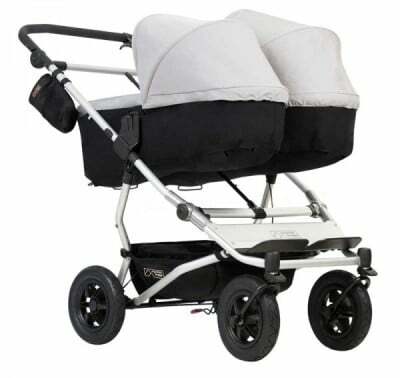 There is also adjustable footrest for each seat to provide babies with maximum comfort. Mountain Buggy Duet is also a perfect choice for parents who have only one child but are planning to have bigger family very soon. It is a great stroller for the first time parents, who are planning to have the second baby quickly after the first one. 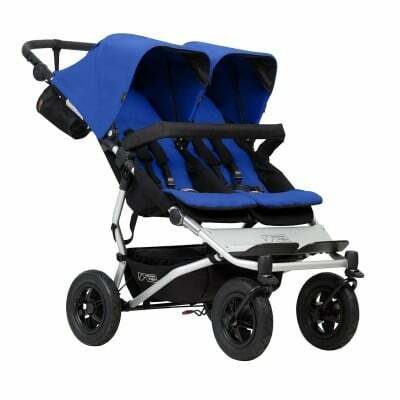 Bugaboo Donkey Twin offers similar solution of converting double buggy into mono. 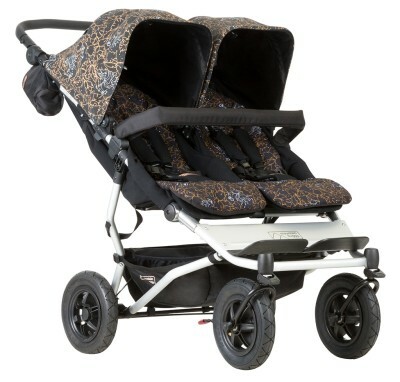 As you can see Mountain Buggy Duet is a convertible stroller and offers many seating options! This stroller is a perfect choice for parents who like flexibility and versatility! Mountain Buggy Duet provides not only comfortable, but also very safety ride. Here are some features that ensure your little ones are having safety cruise. This stroller is equipped with single action foot-operated parking brake. It gives you and your passenger more safety and is very convenient to use when you are pushing pretty big weight of two children. The brake is easy to set and release. Mountain Buggy Duet 2017 has also hand-operated control brake. This one gives parent full control of the speed maneuvering. It’s very useful especially during strolling in hilly area and on dirt trails. Handbrake gives you additional confidence when you are handling and pushing the weight of two kids and allows you to slow down at any time. Each seat has a five-point harness with an unlock buckle in the middle. The buckle is easy to open for parents, but difficult enough for small children’s fingers. The harness can be adjusted to passenger’s height and size. There is one adjustment for upper and lower straps. To change shoulder strap height we have to rethread the strap. There are three different height options. In the newest model – Mountain Buggy Duet 2017 parents can also adjust the crotch strap as the child grows. Duet is equipped with adjustable handlebar. Its height ranges from 31 to 42 inches from the ground, so it is suitable and comfortable to push for all-height parents. 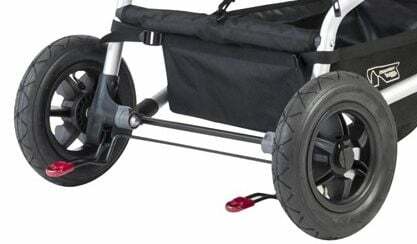 This is very useful feature, however I would prefer telescoping handlebar instead of rotating so the tall parent with long legs could have more space behind the stroller. Each seat is equipped with a canopy, adjustable separately. Each sunshade has good-sized, peek-a-boo window with magnetic closure. Canopies have also flip out visors with SPF 50+ protection. They provide decent shade, however, I wish the they were a little bit bigger to provide better cover. 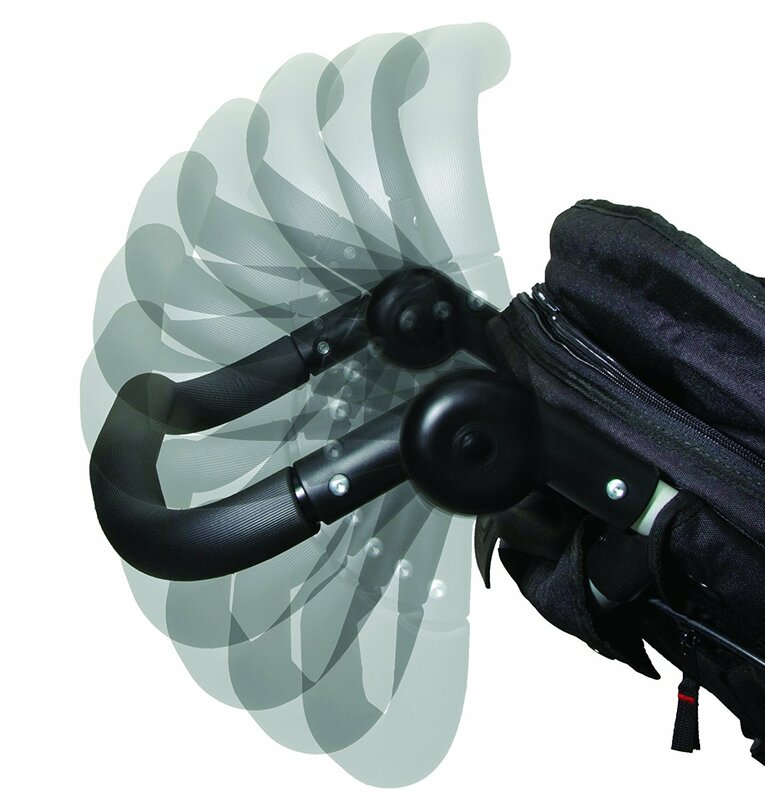 This stroller has a large underseat basket, that can accommodate up to 11 lbs. I could easily fit there a large diaper bag. The size is enough for a day trip! My Mountain Buggy Duet review wouldn’t be complete without a discussion of advantages and disadvantages of this stroller. Check out my table with the most important assets and flaws. Here you can watch a video from Mountain Buggy which shows how to use the stroller and its every feature. You can also find some information about Mountain Buggy Duet specification and features on the brand’s official website. 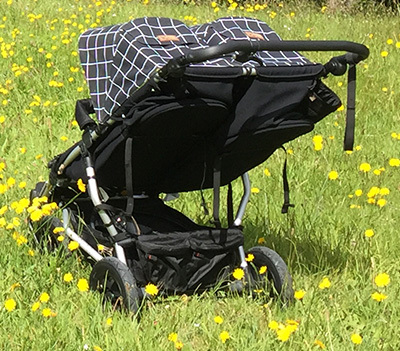 The newest 2017 version of this stroller – Mountain Buggy Duet V3 is available in 5 different colors: Grid, Marine, Black, Silver and Year of Rooster (Special Edition). The 2016 version of Mountain Buggy Duet is available in 7 different colors: Black, Chili (red) Flint (grey), Ocean, Orange, Royal (blue) and Cyber (yellow). Here you can check all Mountain Buggy 2017 Duet V3 color versions and Mountain Buggy Duet 2016 color versions. In my review I concentrated on the newest model (2017), however I would like to show you my comparison: Mountain Buggy Duet 2016 vs Mountain Buggy Duet 2017. There are some difference as the manufacturer upgraded few features for the new model, but these two strollers have also several similarities. I always check other parents reviews of the stroller I’m about to purchase. 2017 model doesn’t have many reviews yet (at least at the time I’m writing this). But here are the things that customers often mention. Parents love its size, soft fabric on the seats, removable padding, deep recline, handbrake and smooth maneuverability. The seat are big enough to accommodate 3 and 4-year-old kids. The disadvantages that parents mention are: soft foam grip on the handlebar which is easy to tear, air-filled tires that require frequent inflating and heavy construction. Here you can find more reviews written by other parents: 2017 model and 2016 model. This stroller weighs about 32 lbs so it’s not the lightest one. I’m a short and petite woman and lifting it or putting into the car trunk was doable for me, but for some parents this stroller may be heavy. Also, to use it for newborns parents need additional attachments like cocoons, carrycots or infant car seats. 1. 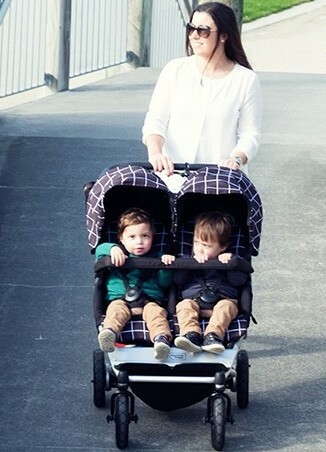 This is a double stroller that is compact and easy to steer like a single one. 2. Thanks to many different seating options and great balance this stroller can be used not only for twins, but also kids at different age and weight. 3. Forget about wide and clumsy double strollers! This one is slim like a single stroller so it goes through doorways seamlessly. And thanks to perfect weight distribution you won’t have any problems with lifting the front wheels to go over curbs. If you are looking for a high-quality, convertible and versatile stroller for two kids (siblings or twins) Mountain Buggy Duet can be the perfect option for you! This stroller is great for everyday city use and off-road cruises. Thanks to many seating options you can use this stroller for one or two babies, from infancy till toddlerhood. 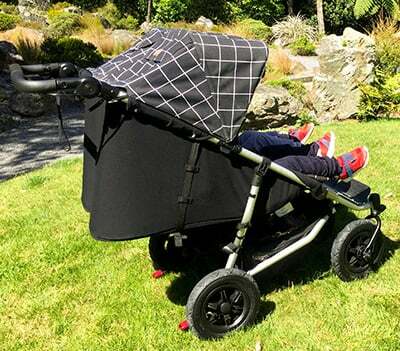 This buggy is an investment for years: you can start strolling with an infant car seats, cocoons or bassinets attached to the frame and then switch them for a full-sized regular seats for a toddler. Even if we use this stroller for kids of a different age and weight, the stroller is still stable and doesn’t pull to one side. 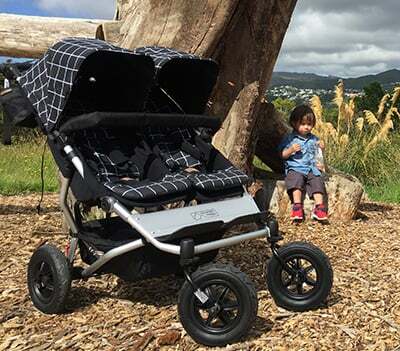 Mountain Buggy Duet provides not only a safety, but also very comfy ride! Thanks to compact size parents can go shopping with this stroller and easily fit through narrow store alleys. 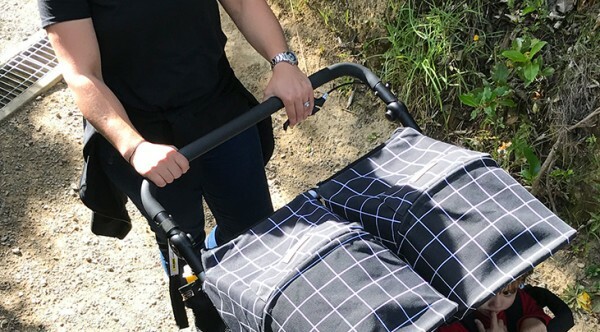 As I tried to show in my Mountain Buggy Duet review, I’m sure every parent will be pleased with this stroller functionality and its nice look! My husband and I are expecting twins and I’m trying to figure out which car seats are compatible with having 2 carseats attached. I’ve been trying to research but keep getting confused. I would much prefer the Chicco carseats but I don’t know if I can have 2 of them attach. Do you know? Or would it be easier/more cost effective just to have 2 newborn cocoons for them until they are big enough to be in the regular seats? Hi Felicia! Mountain Buggy Duet is one of the few strollers that allow you to attach two infant car seats at a time, you just need a proper adapter. Keep in mind that Mountain Buggy offers different adapters for different countries (for example in Europe not all adapters are available). I love this stroller but I am curious about car seat compatibility. Can any infant car seat fit or do you have to buy a specific brand/model of car seat? Keep in mind that when you want to attach one car seat you need to choose different adapters than when you want to attach two car seats at a time. I’m looking into this stroller. Can you put a car seat and a toddler seat at the same time on this stroller or is it too skinny for that? We have 14 month old twins who are walking. We currently have an UppaBaby Vista but are looking for a side-by-side all-terrain stroller to take them on trails. All the twin Moms recommend the Mountain Buggy but I’m concerned the seats are too reclined even in the most upright position. My boys are very active and like to look around. How do you find the seats? 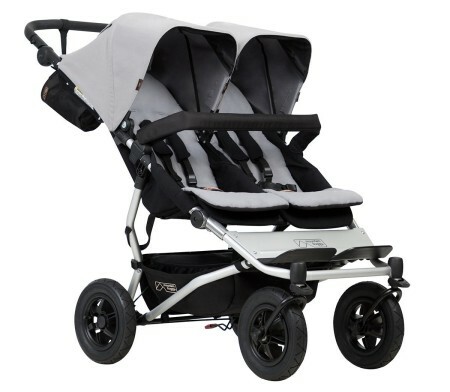 Is there a double all-terrain stroller out there with more upright seats or is the recline a necessary feature of all the all-terrain strollers? Hi Vivian! All-terrain strollers usually have a bit reclined seats, even in the highest position. This is also the case with Mountain Buggy Duet unfortunately. Frankly, I haven’t found a stroller with fully upright seats that could go over harsher terrain at the same time yet. However, I think there is one model that you may want to consider – BOB Revolution Flex Duallie 2016. It is not only an all-terrain, but also a jogging stroller. So it won’t let you down on trails, bark chips, grass or even snow. It weighs almost the same as MB Duet. It’s also cheaper (some color versions sometimes cost less than $600). Just make sure to pick the newest version – 2016 (you can see it here)- because it has more upright seats, many parents love Flex for that feature. Hi, can the duet be folded with the bassinet connected or does it have to be taken off every time? Hi Laura, you have to take it off. Hi there, I wondered if you thought you could fit a buggy board on the bag of the 2017 Mountain buggy Duet V3? If so, what make buggy board would you recommend? I have a 3 year old, a 17 month old and 1 more baby due in 6 weeks, so looking for an option that might fit all 3! Thanks. The Freerider board by Mountain Buggy is also good. The easiest way to fit it in the storage basket is to detach the board from the handlebar and then those two pieces can be stored in the basket. You may also want to check if there are any universal boards that are compatible with most of the strollers and don’t take up so much space, but I unfortunately I can’t recommend you any model as I haven’t use any universal board.